We might have mentioned before that Paloma’s older sister attends college in New England. We miss her living at home, and always look forward to her arrivals during school breaks, one of which happened to be last week. I’m sure many of you, who live up North, have experienced this year’s brutal winter firsthand. It’s been snowstorm on top on ice storm many times around. Meanwhile, here in Central Florida, we’re enjoying mild temperatures and sunshine almost every day. That is one of the rewards for surviving Florida’s persistent summer heat. Another benefit of Floridian winter – now is when our growing season finally peaks. The Saturday morning market is overflowing with local greens and vegetables, and the neighborhoods are dressed with bright, orange-spotted trees. We always look forward to this lovely time of year. I came up with a welcome home brunch that speaks of warmth and sunshine and, hopefully, makes the cold winter seem very distant. 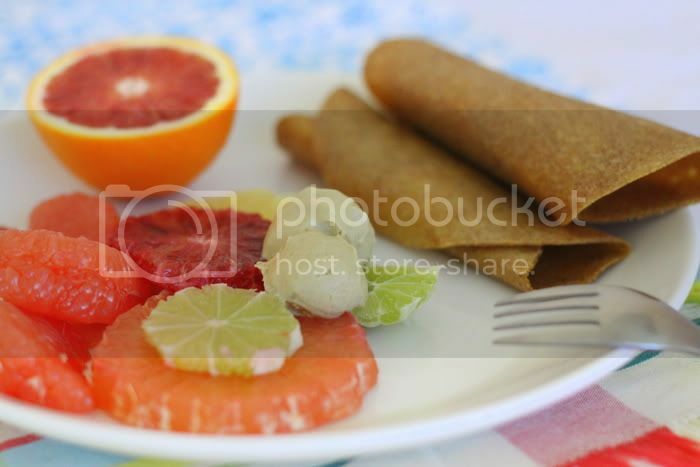 Orange-cinnamon crepes, accompanied by a colourful citrus salad with an Earl Grey-orange creme. Crepes are the ultimate comfort food – delicious and versatile as can be. As always, I had to find a healthier alternative to the original, but one that could truly satisfy our crepe craving. It worked, they turned out not in the least bit less delicious. 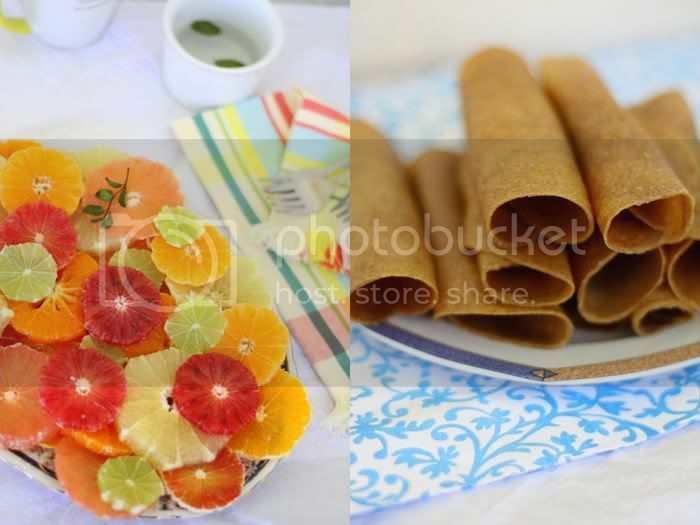 The cinnamon and orange flavours combine smoothly in a thin young coconut-based crepe. The shapes and all the different colours of cut citrus remind me of little suns. 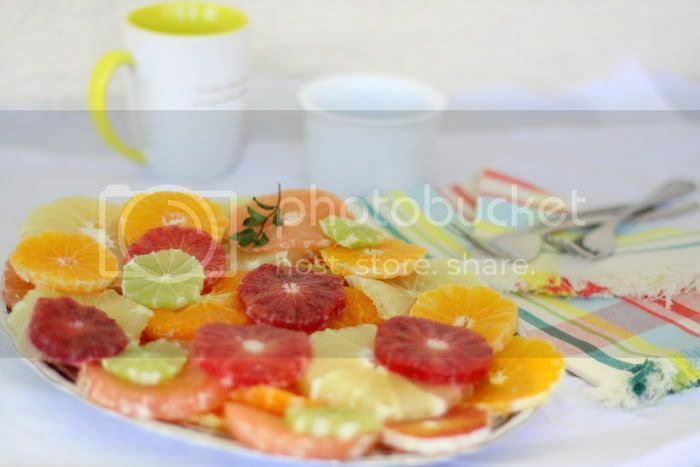 Appearing on the plate are blood and navel oranges, pink, white and ruby red grapefruit, tangerines, clementines, and limes. A citrus feast. We’re a avid tea drinkers, and this winter has been all about Earl Grey – we just cannot get enough of it. Its wonderful flavour inspired me to experiment with Earl Grey as an ingredient for something other than a drink. The creme that I ended up using it for was a winner with its subtle flavour and beautiful tea-dyed colour. Our cold student arrived late Saturday night, and even Paloma was impatiently waiting for her at the arrivals gate. Sunday morning was full of sunshine, laughter and beautiful, bright food. Nothing like having the whole family under one roof. She stayed home for a short week, during which we made and photographed all kinds of new dishes. We cannot wait to share them all with you. In a high speed blender, combine the coconut meat with the orange flesh, adding coconut water as needed to achieve a smooth, thick consistency. Transfer to a large bowl and combine with the rest of the ingredients thoroughly. Spread the batter on Teflex-lined dehydrator trays and dehydrate at 115F for 6-8 hours. Flip them over, peel away the Teflex, and dehydrate for another 1-2 hours, or until the surface is dry, but the crepes are still pliable. Cut on a cutting board with a circle cutter or a sharp knife into the size and shape you prefer. Steep the tea leaves in hot water for about 5 minutes, drain and chill. In a high speed blender, mix the tea with the rest of ingredients until smooth. Refrigerate overnight to thicken. Peel, cut and arrange the citrus on the plate. Garnish with fresh mint. Serve with the Earl Grey creme. 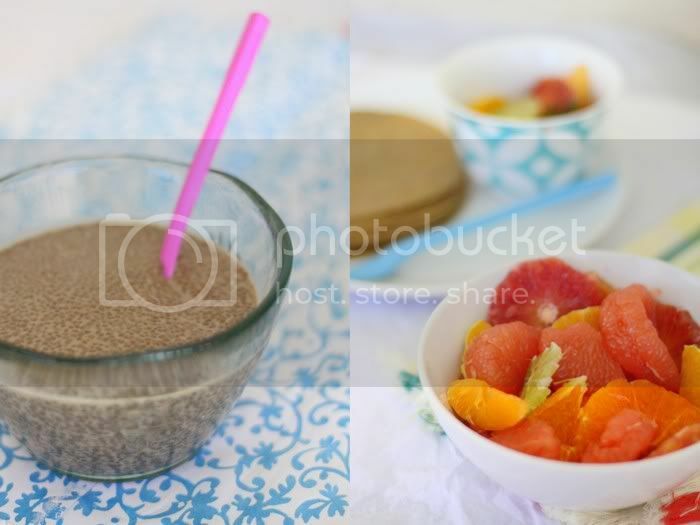 Optionally, you can separate the grapefruits into segments, cutting and peeling away the membranes to expose the flesh. A beautiful, blissful brunch! Everything sounds incredible. I love Earl Grey and can’t imagine a more perfect compliment to the selection of citrus you shared. I’m glad you had a special week with your girls. Yeah!!! :) thanks a lot!!!! Breathtaking! Crepes are one of my favorites when it comes to food. Can’t wait to give these a go!!! Oh my word, if only I cold beam myself there! Looks and sounds just divine! Lovely shots once again. I think I am officially in love with your blog <3 :) Thank you for all of the lovely, beautiful posts. Here on the West Coast of California, and close to Ojai, the citrus season is also in full swing and the farmer’s markets are a delight. We do not have coconuts growing here, as you do in Florida (lucky you!) but we have the citrus and I’m fascinated with your use of Earl Grey tea. Beautiful images as usual…..love the introduction of blue to the saturated warm colour palette as the blog rolls down. It sings. Oh my! That fruit tray is gorgeous. 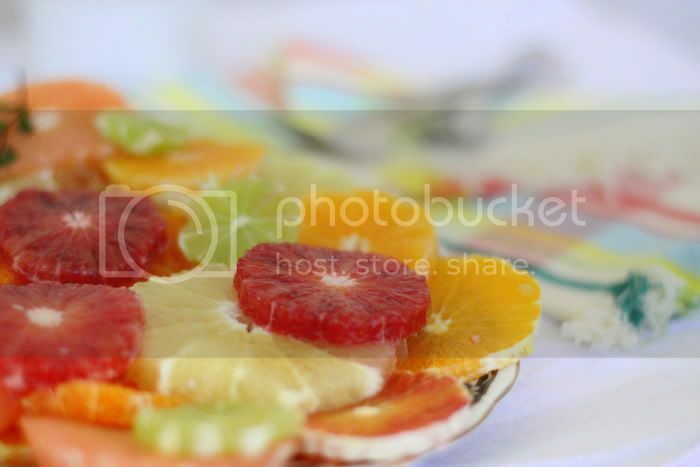 That is absolutely the most beautiful presentation of citrus fruits (or any fruits) that I have ever seen. That to me is your very highest gift. The incredible magic of beautiful presentation. Thank you for the inspiration. Fresh citrus fruit, warm winter sun in the middle of Feb – can’t imagine why you enjoy living in Florida! What a wonderful ingredient to roll your crepes with. Love the photos! I have a question, young coconuts are almost impossible to find in Europe, can you replace them with something? An old coconut or something else? 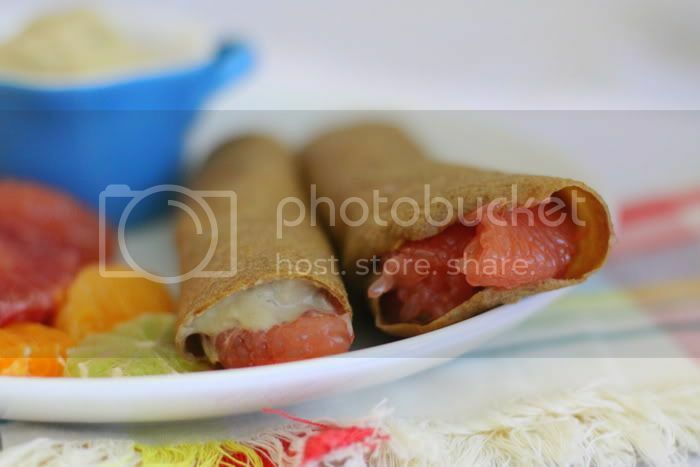 I can’t wait to try your crepe recipe! As always, I am in awe and so inspired by you. thanks for another great post. Wow, so pretty!! 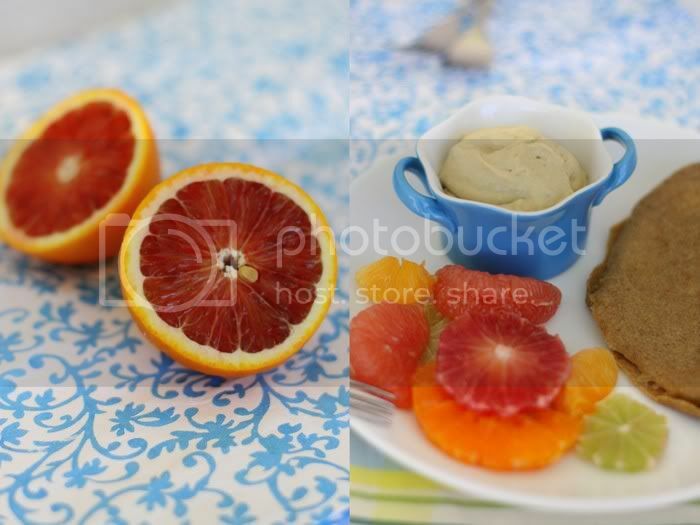 A wonderful way to enjoy citrus, especially with the delicious sounding Earl Grey Orange Creme, yum!! What a beautifull blog!Thank you for doing it!It’s a pleasure for the eyes,tummy and soul! Thanks to everyone for the wonderful comments! What a great way to start the day! As always, your dish is beautiful. beautiful beautiful! your post gave me the urge to juice some grapefruit :) I am loving your recipes, and the earl grey cream is so unique! So I made your crepes and this is what happened. I couldn’t find a young coconut and in my excitement bought an old one. I brought it home started soaking the cashews (I had a handful of raw almonds left in a bag and threw some in to soak and peeled them) and made the tea. Then I cracked open my coconut… and it was rotten. So off to the store I go and I bought another one which I had the sense to shake it this time to see if there was any milk in it. I cut my finger straight threw the thumb nail pretty badly trying to get the meat off the thin layer of skin. I made the cream and although it wasn’t creamy, it was pretty smooth and over night it set up BEAUTIFULLY and tasted so WONDERFUL and unique and it was just, divine. Thank you. My crepes didn’t turn out nearly as well. They were fairly chunky and although this took away from the “rawness” of the recipe, I didn’t have quite enough coconut so I added some apple sauce. The end result was sort of chunky. But after all of that effort, I put them on my ancient dehydrator anyways. My dehydrator is a round tower with a hole going up through the center so I had to preshape the crepes so they weren’t perfectly round with smooth edges. And because of the chunks, well once they dehydrated they weren’t beautiful to say the least. They tasted good, but I think the texture took away from the taste. But with that said, my food processor is somewhere around 20 years old and isn’t incredibly high powered. I think with more power it wouldn’t have been as chunky. So now I am eating my delicious breakfast. Thank you for the recipe. I hope I can try again with a properly young coconut and then I will make so much of that cream!